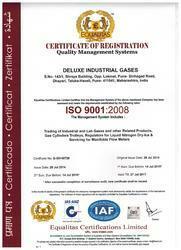 Incepted in the year 2006, “Deluxe Industrial Gases, Pune” stands firm in the world of Industrial Gases & Welding Material since 2006. We are well known throughout the industry for supply of various Industrial gases and Cylinders as well as gas handling equipment. Our entire gamut of products include Gas accessories, Gas Equipment, Cylinder and gases, Cylinder trolleys, Gas regulators, Cryocans, Portable gas canisters, industrial gases, Gas handling equipment, UHP grade specialty gases and gas monitoring systems. We share a long lasting association with Inox Air Products and other well known vendors, who help us in meeting the bulk demands of our clients. Further, the continuous support of our talented and well experienced team has helped us to define the success of our organization over these long years of trading. The entire team dedicatedly works to make sure that quality is guaranteed every time. In addition, we regularly hold trade talks through which we cater to varied queries of our clients. Moreover, our team of logistics expert adheres to timely shipment of products and thus always looks forward in establishing long term business relationship with various organizations. Owing to our ethical business policy, we share cordial relations with all our clients spread across the globe. Our CEO, Mr. Ashish V. Godbole has played an instrumental role in the success of the organization. With his brilliant academic background of B. Com and MBA in Finance, we have been able to understand the intricacies of business. He is supported by Mr. Arun M Shah who is a B.E Mechanical and has adequate expertise in the respective domain.  To extend our services to a wider range of customers and establish a transparent relation with them through providing our best quality products and services.  To foresee the market demands and work constantly to meet the present and future needs efficiently. Owing to our wide network of distributors, we are able to make our products easily available all over the country. Further, they help us in offering our products within stipulated time frame to the client's end as well as meet their ever increasing requirements. Our strong network system facilitates us in exploring new market areas and increasing the sale of our sourced products. Further, our sales professionals lay out distribution strategy and works diligently to promote the sales of our products. Cylinder and Gases that include wide variety of Cylinder & Gases. Cylinder Trolleys comprised of Single Cylinder Trolleys and Double Cylinder Trolleys. Gas Regulators including various kind of Regulators. required for all types of Gases. Cryocans that includes various sizes used for filing liquid Nitrogen. Portable Gas Canister like Disposable Aluminium Canister and Gas canister With Regulator. A broad line of Gas Handling Equipment that comprise of Diffusion Resistant Gas Pressures, Regulators, Pressure Gauges, Accessories, Gas Sampling Bottles and Gas Manifolds. Gas Monitoring Systems that include Gas Chromatographs, Gas Analyzers, Ethylene Dosing Systems For Fruit Ripening, Data Integration Softwares and Gas Leak Detectors. Array of UHP Grade Specialty Gases such as instrument Gases, lighting Gases, Hydrocarbon Gases, Inert Gases, Isotopic Gases, Toxic Gases and Pharma Gases. Known for their qualitative features like high efficiency and best quality, these are widely used across various industries. Every product is made to undergo stringent quality control tests at the vendor's site as well as is inspected by our team of quality auditors. This is done in order to ensure that only defect free products reach customer's end. The coercive efforts of our professionals has been the reason behind our glorious success. We own a talented team members, who hold adequate expertise in their domain. The whole team comprises of administrators, procurement professionals, quality inspectors, marketing & sales personnel and skilled laborers. Owing to their integrated efforts, we are able to deliver the product that precisely meet the client's requirements and thus deliver absolute customer satisfaction. We further, make sure to conduct regular training sessions and practical workshops for our team to keep them abreast of latest technological innovations.